When it comes to whipping up a light dinner in a flash, wraps and pita breads are my culinary saviours. I always keep a stash in the freezer, ready at hand for those meal emergencies. Whatever the filling, as longs as it comes wrapped up in a wrap of some sort, everybody always seems happy. 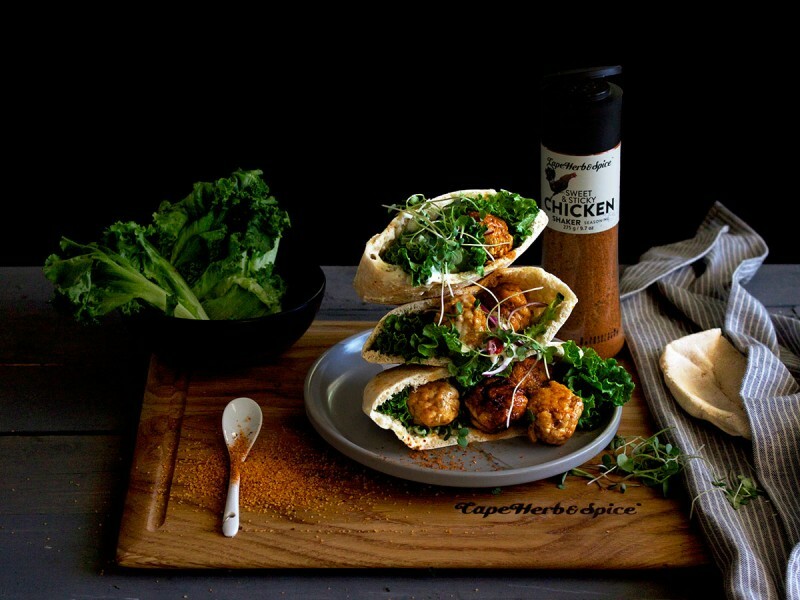 Cape Herb & Spice’s Sweet & Sticky Chicken Shaker Seasoning is another versatile crowd pleaser. It’s salty, sweet and spicy all at the same time with aromatics like paprika, coriander, garlic and just a touch of chilli. Mix it up with chicken mince to make juicy meatballs for a pita pocket stuffed with frilly lettuce. Complete the picture with some finely sliced red onion, cucumber or radish (or whatever else takes your fancy) along with a quick low-fat yoghurt drizzle. Fresh, light, healthy – that’s dinner done. Soak the bread in the milk, then use a fork to lightly combine it with the mince, spring onions, lemon zest and Cape Herb & Spice Sweet & Sticky Shaker Seasoning. Scoop out tablespoon measures of the mince mix and roll to form small meatballs. Shallow fry the meatballs over medium heat in cooking oil of your choice until cooked through and golden. Combine the yoghurt with a pinch of salt and the garlic. Slice toasted pita breads in half and pack with frilly lettuce, warm meatballs, any other vegetables of your choice and top with the yoghurt drizzle. For a light lunch or starter, slice nectarines in half, brush with olive oil and dust over Sweet & Sticky Chicken Shaker Seasoning. Place cut side down in a hot griddle pan and fry just until you have caramelized lines. Serve the nectarines with finely sliced prosciutto crudo ham on a bed of rocket, watercress and baby butter lettuce lightly dressed with simple vinaigrette.